I used a beautiful, bright AAA quality piece of orange carnelian and oxidized it when I was done. I loved it! I found myself totally energized and eager to make more. So I did, of course. Find this necklace in my Etsy shop HERE. I decided though I loved the look of the full silver I wanted to know what it would look like with mixed metals too, so I broke out the pink gold and the yellow gold and gave it a go. First, I mixed pale green phrenite with rose gold and silver. I found the combination pleasing. It seemed both warm and cool at the same time with a soft edge to it. Find this listing in my etsy shop HERE. Next, I decided to try chrysoprase combined with yellow gold and sterling silver. This is just super AAA quality chrysoprase. I added a gold chain to this one because I wanted the gold to dominate and for the silver to just be the accent. I will be so sorrowful when my supply of this chrysoprase is exhausted. I bought up all that I could before it was gone. Find the listing for this mixed metal chrysoprase pinned necklace HERE. Next I decided that they must have earrings, so I gave decided to try a pair. I did them in all sterling to match the carnelian necklace and I think they rocked. I basically took half of the necklace bar to make the earrings. I only made the sterling pair as my day was coming to an end and the weekdays are dedicated to custom work for the most part. Maybe I’ll find time to squeeze in matching earrings for the other two necklaces at some point this week. You can find the listing for these earrings in my Etsy shop HERE. Find the listing for this pinned turquoise necklace in my Etsy shop HERE. I really enjoyed following my muse this weekend. Now it’s time for me to get back to the grind though. Back to one maddening custom order that I’ve been redoing and redoing and redoing… I want it to be perfect! I can’t wait to show it off when it’s done. I’m finally feeling good about it – no hints! You’ll have to wait to see it. I have six enameled bangles I’m working on, three rings, a dragonfly pendant, a pair of earrings (with posts, different for me) a gemstone bangle, a custom pinned pendant, a pair of pinned earrings…. the list goes on. It’s going to be a busy week! It’s been a while since I posted here so I thought I’d pop in and share some pictures of some custom work I did a little while back. There’s a gem collector in my area that loves my wire wrapping and he sent me home with a batch of stones to wrap for him. These are large stones, very lovely too. First a picture in hand to show the size of these gems. 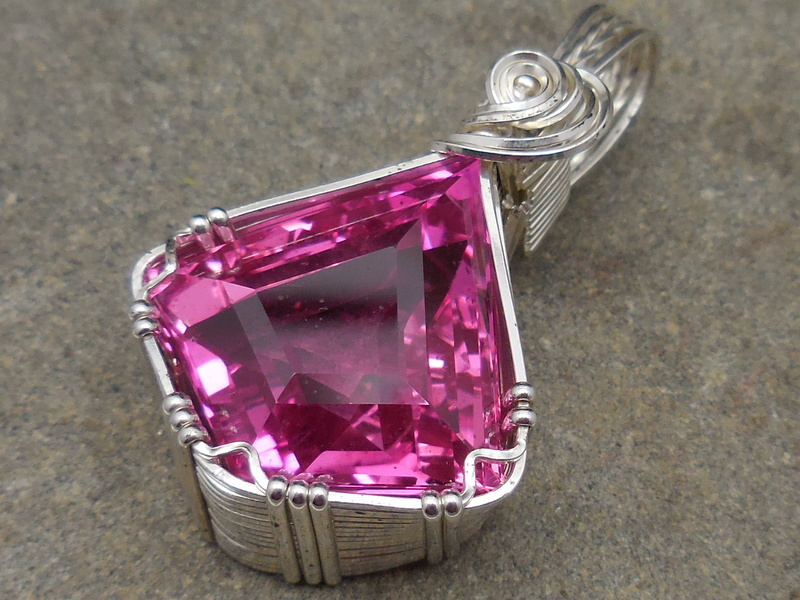 I had two pink topaz stones so I wrapped one in silver and one in gold. I think they turned out pretty well. 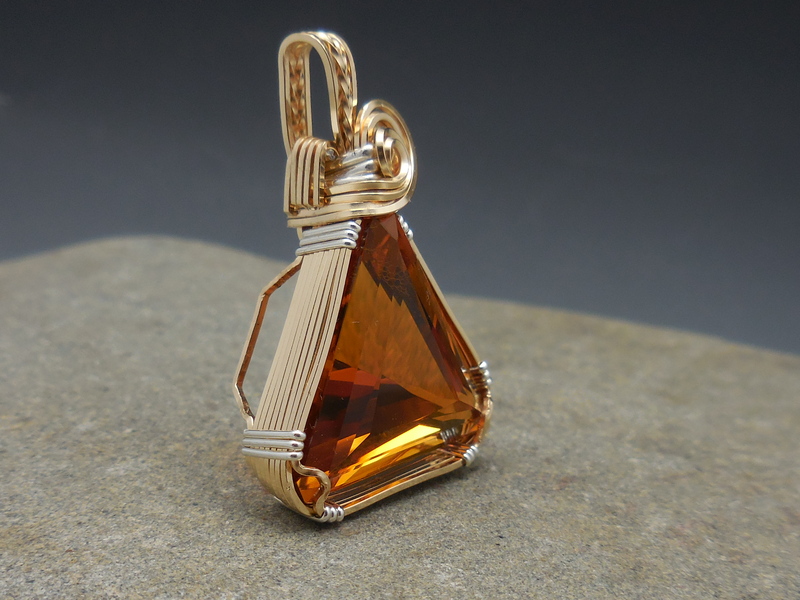 I really loved the result of this beautiful citrine wrapped in mixed metals – predominately gold with sterling silver accents. 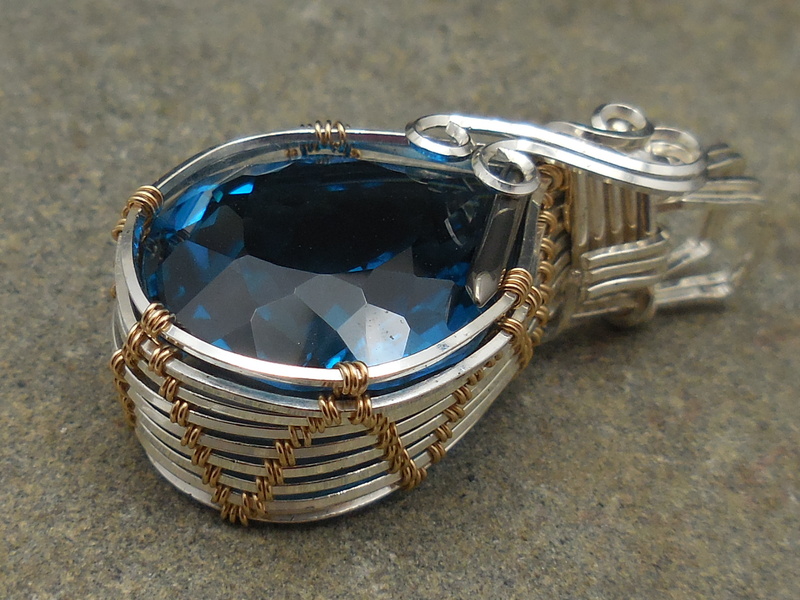 Finally I tried something different with this london blue topaz (I think that’s what it is). I LOVE the color of this stone. This is a popular binding method but I’ve never seen it used to wrap a faceted stone before so I thought I’d give it a go. What do you think? Fortunately, the customer liked them very much… but there’s still one left! 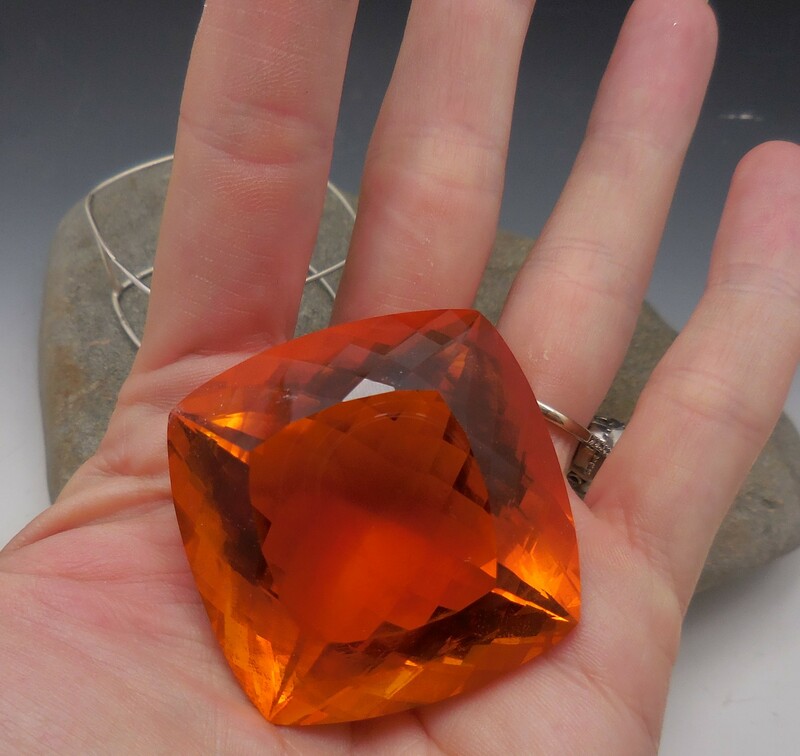 A HUGE citrine that is about half the size of my palm. I have been working on something special for this piece. It’s a challenge! Let me tell you! I’ve already wrapped it twice and decided I didn’t care for the results. It’s such an amazing stone that I feel it deserves an amazing wrap so it’s now on it’s third incarnation, and I am so far loving the direction it’s headed. I hope to have it finished up by the end of the week. I’ve never done anything quite like this before (similar in ways to past work, but with a different approach) and I can’t wait to share the final results with you! Just for fun, here’s a preview picture to show the size of the stone and give you an inkling of the direction I’m headed… but JUST and inkling! Hmmm… a soldered frame. Whatever could I be up to? Keep an eye out and you’ll soon find out! I’m a little over half way to completing this gem. Organic Enameled Bangles now available in my Etsy shop! Loving these colors together like I do, I couldn’t resist making some enameled embellishments to add to my enameled bangle. I absolutely adore the way this turned out, and of course it doesn’t hurt that the color combo on this bangle ties together perfectly with the other two bangles I made before it, so they make for a dynamic stacking trio! And they look FABulous on, don’t you think? There’s already a big buzz going around about these bangles and people are asking if I will be selling them. Well, OF COURSE I will be! Look for listings to show up in my etsy shop next week and of course I will post a courtesy message here so that my adoring fans don’t miss out! You know you want one – or THREE! A new obsession is growing. Of course, I’m just over the hump of the last obsession (pinned pretties) and still hungry to make more pieces like the ones in last weeks post, but I’m driven to try new things to keep the creative juices flowing. My love of enamels is still going strong. I love adding color to metal. It makes something that might otherwise seem ordinary POP and I’m popping like Jiffy Pop in the studio right now! There’s a reference there that only folks from my generation are likely to get. :::nod to my older homies::: Anyway, what’s all the excitement about you wonder? 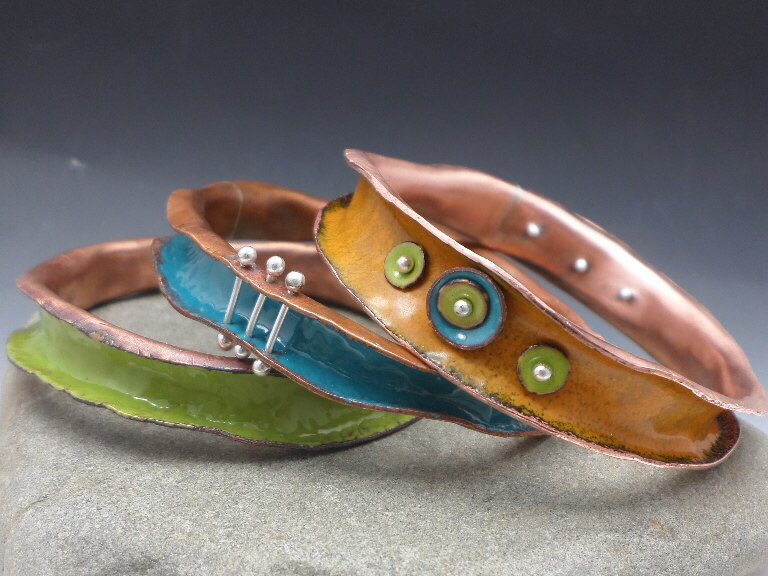 Organic enameled bangles, that’s what. I’ve only made a couple so far because I have a lot of orders on the bench (not a complaint!) and I’m torn between being a good girl and cranking out those orders and being a bad girl and following the path my Muse is laying out before me. She never wants to do the stuff I’m supposed to be doing, naughty girl. It’s all play, play, play and who needs to pay the bills and feed the kids? I do, dear Muse… But she is relentless so I had struck a bargain with her: I must accomplish some of the must do stuff and in between I will reward myself with a play break to do the wanna-do-fun-stuff. So here are the results of my ‘play breaks’ over the last couple of days. A good bit of labor goes into these babies. Of course, I’m learning now so the going is slow and I’m sure I’ll get faster with time, but some things just can’t be rushed. First of all, there are no short cuts in cutting these babies out. For smaller pieces, like rings, I can order them pre-cut to the width I want and then only have to cut the length, but with these bangles being 8″ in length that’s impossible. Even the metal suppliers don’t have bench shears that will cut something eight inches long apparently, so I have to cut them by hand with a jewelers saw. Dear God, how I hate sawing. But saw, I must. I had to start with a 18″ x 6″ sheet of copper. My bench pin is only about 5 inches long (a tool used to brace metals while you’re cutting so they’re not wobbling all over the place making it nearly impossible to complete the objective) so it was almost no help in the process. I had to cut the 18″x6″ into 8″ x 6″ pieces, then divide each piece into as many bangles as I could get out of it, marking my cut lines with a sharpie – and of course I couldn’t find my fine point sharpie. UGH. It makes better lines to follow with the saw blade. Here I’ve cut the sheet down to 6″x8″ already and now I’m cutting the fist bangle blank out. After cutting out the blank, there’s filing, making sure my ends are flush to solder (solder doesn’t fill gaps – and gaps are the kiss of death in this project). Just the cutting, sanding and filing takes a good amount of work. Once this is done, I can move on to soldering. I have my bangle, cut, filed, sanded and soldered so now the real fun can begin! Next I hammer and form to change the character of the bangle. I really like the organic look that these bangles take. My first bangle took me three hours or so and it didn’t even have the cool embellishments! I wanted a ‘LOOK AT ME’ color on the first one, so I chose bitter green. It’s a favorite for me anyway as I’m a green girl so that had a lot to do with my choice. I kept the first bangle simple. It’s not exactly what I was going for, but overall, I like it. It was enough to make me want to continue and make more. So on my next play break I made one in turquoise and this time I added some pinned embellishments. I also tried flame painting the inside of the bangle. I couldn’t get the colors the same on both sides. On one side it came out more pinky, blue and on the other side it came out more bronzy. I really liked the bronzy look as I thought it make the turquoise pop. The green one has bright, clean copper finish on the inside. The next one I plan to oxidize. What do you think about my turquoise? First, here it is with the bright, clean copper finish. Now a close up of the pinned embellishments. Now, here’s the bangle with the flame painted finish. I’m diggin’ it! How about you? I’m planning on making a third one to complete a full stack in my favorite color combo; Turquoise, bitter green and marigold. Alas, I must get more ‘must do’ stuff done before I’m allowed to take a play break again. Meanwhile, here’s a picture of the two I’ve completed on… I think they look even cooler stacked. Can’t wait to see these two with the marigold! Now, back to work with me. I have orders to get to the post office and orders to produce. If I’m really good and get enough done to reward myself with a play break, I’ll be sharing a new marigold one soon. I have different ideas for embellishments on that one. No telling… you’ll just have to wait and see! Eventually, these will be available for sale in my etsy shop! So if you love them and can’t live without them, hang tight! Pinned Pretties – A New Technique! So here’s a technique that I’ve wanted to try for years – literally! Don’t judge… it takes time to get to things. I have tons of techniques and projects that have been on the back burner for some time but haven’t had time to get to. The important thing here is that I finally got to it – and I love the results! Loved the results so much that I was kind of obsessed for about a week. It’s all I wanted to do – though grudgingly I had to put aside play time and do the stuff I actually needed to do. So I stuck a deal with myself – I’d do the ‘must do’ stuff, take a break and make a pendant or pair of pinned earrings, then go back to the must do stuff so I could reward myself with a little play break again. I created quite a few petite necklaces over that week under this arrangement so I thought I’d share them with you here. I was, after all, very kindly admonished for my lack of social media presence over the past year by some faithful followers at the Art in the Park show in Foley a couple of weeks ago – you know who you are. 🙂 I wish I had taken your pictures so I could include you in my blog – maybe a photo of you wagging your finger at me, like ‘shame on you, abandoning your fans!’ lol So here I am, sharing, to show my loyal readers that I really DO care about them… Can you feel the love? 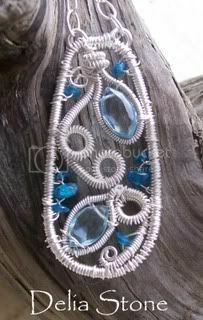 Well, since I purchased a number of those amazing kyanite drops I thought I’d create a necklace to match, and so I did. 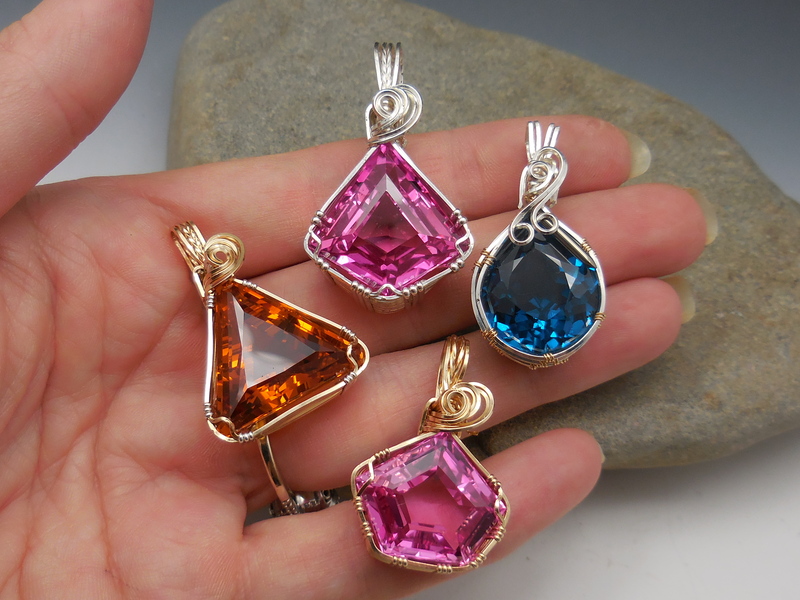 Sure it’s petite, but the stones are beautiful and I didn’t have to do much else but show them off and this technique is perfect for putting the focus on the stone – and of course, there’s that fun kinetic element since the stone swings freely in it’s setting. Kinetic fun is always a plus! You can find these pieces in my etsy shop here: Pinned Kyanite Earrings and Pinned Kyanite Necklace. And if you know me, you know I love the color green and I love the stone chrysoprase. A beautiful, bright green stone. I’m get all dreamy eyed just thinking about it… no, really. I find this green simply entrancing. I scored some AMAZING quality chrysoprase, triple a grade, and created this little treasure. Now if those aren’t lovely enough, I decided to make a very simple pinned pearl necklace and as much as I love the kyanite and the chrysoprase I have to say I think I find the simplicity of this setting paired with the pearl to be quite striking. It makes for a classic sort of beauty. What do you think? I also had fun with a turquoise bead. It needed a little something extra though so I made some mill textured bead caps in sterling and copper to cap each end before setting it. I liked the way it turned out. A very different look for the same setting, I thought. And there were many more. Some sold before I could get photos. Some I haven’t gotten pictures of. There are more earrings too. Maybe I’ll get some photos of them up eventually as well? I really enjoyed this technique and there will be many more pinned pretties to come. I can’t wait to experiment with fun new ways to incorporate this technique into other jewelry designs as well. Stay tuned! This obsession is sure to grow. The world has been going by at the speed of life! I’ve been left breathless with all of the changes happening in my life and I’ve seriously neglected all of my readers. :::hanging head in shame::: You will be glad to know that I haven’t dropped off of the face of the earth – I am alive and well! So, feeling contrite about my absence here, I decided that I must redeem myself and check in. I have been a busy little bee, make no mistake. The torch in my studio has been humming! I’ve been making enamels galore and wire wrapping like a mad wench! :::crazy laughter fills the studio::: Muwahahahahaaaaa! So many pieces have come and gone without being documented that part of me despairs. It’s like sending children off into the world without so much as a single baby picture to keep close to my heart. Life’s pace has just been too hectic. I have resolved, however, that despite the time challenges that fill my life I MUST get back to sharing my work with the world at large – not just at art shows and galleries, but here… with my fellow artists and fans who enjoy the little view into my world of wonder and creation. Today, I take my first step forward in this resolution to share a few pictures of recent work with you. More will come; process photos, views of new work on the bench, news of new directions and experiments in both old mediums and new… but for today, just a few pictures to whet the appetite and get me back in the bloggin’ groove. One of the items people have been requesting for so long is “Peace of the Beach” earrings to match their necklaces and bracelets. I finally created some, though I chose to minimalize the weight of them by creating them in an open form, in otherwords without adding additional wire or metal. They are light weight – and adorable! No bias here! I’ve created them in the round and in the rectangle. Sadly, ovals are out for now but triangle shapes will be coming eventually. I’ve also been hearing many requests for new mermaids. These little ladies aren’t as easy as they look. It’s difficult to create a human/fish form on my tiny canvases, believe it or not. However, I do love them and I’m always pleased when I manage to pull one off well. I rather like this sassy mermaid. I even managed to take a few process shots of her along the way. Early on in the process. Four firings down and MANY left to do. So far I’ve only added color in her hair and in the water along with an application of slivers of fine silver foil to give the impression of movement in the currents in which she swims. 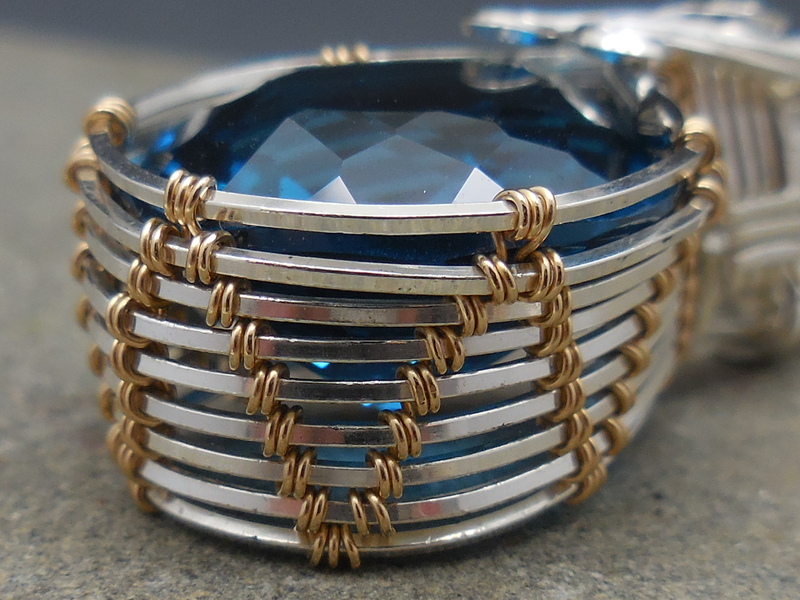 Finished piece wrapped in 14 gold GF wire wrap setting. Another Cloisonne piece I’m pretty proud of is my Purple Mountain Majesty Necklace. I have a couple of process photo’s for this piece too. 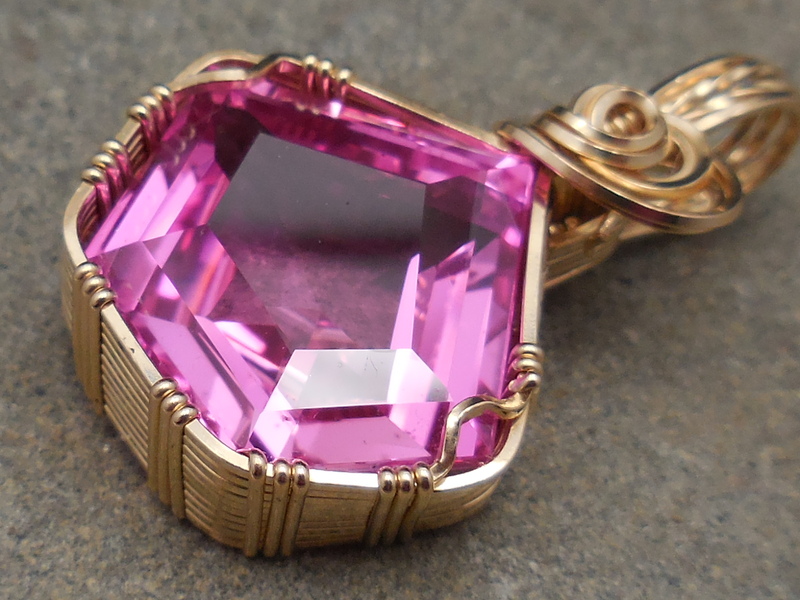 I made the pendant some time back but only recently found a way to present it that I liked. I tried various chains before I finally settled on a hand forged chain with blush freshwater pearl accents. I don’t think I could have found a better match for it. Here’s a picture five or six firings in. Several firings and layers of color later it’s finally beginning to come together. Lots of work left to do, however. As a thank you for hanging in there with me you can take 10% off of your order on any purchase in my etsy shop using this code: WP316 for a limited time. Beginning Metalsmith Tips: How do I make my own silver jewelry? 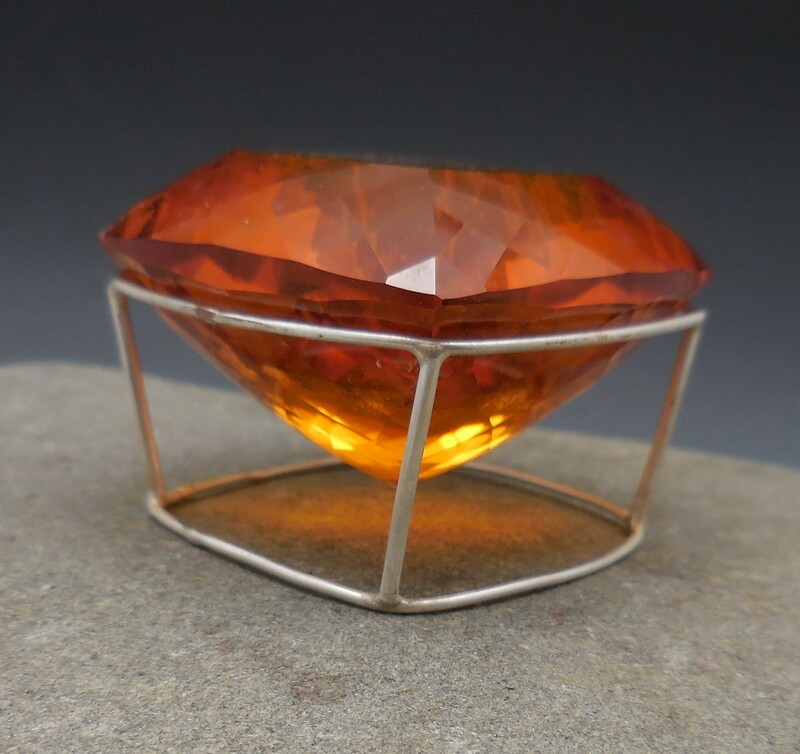 Tips on how to develop your skill set in metalsmithing. Home Jewlery Business Success Tips If you make and/or sell jewelry you will love this site! Painting with Fire Forum Discussion forum for those who love to play in fire! This is Barbara Lewis’ forum for enthusiast of her immersion method enameling technique.